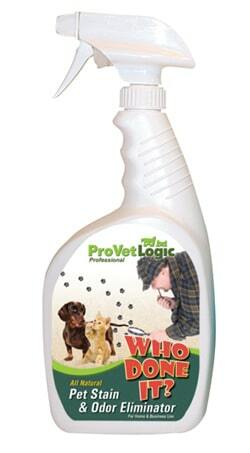 “Who Done It?” All Natural Pet Stain & Odor Eliminator – A natural, enzymatic based solution for the fast and effective removal of pet stains and odors. – Doesn’t mask the odor, it eliminates them completely. – Will remove unsightly stains “And They Won’t Come Back”! 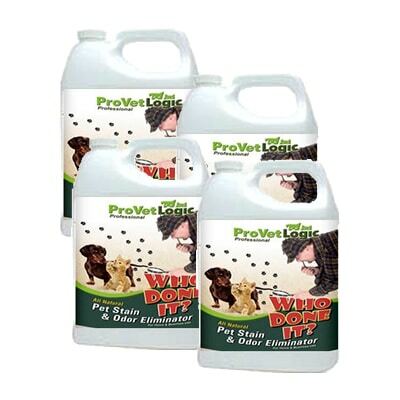 How Does “Who Done It?” Stain & Odor Eliminator Work? On Carpet: The enzymatic solution, when applied liberally to the surface, immediately starts to seek out and breakdown organic matter. The solution will continue to travel through and absorb into the fiber, the base and then into the sub-floor surface. Once the organic matter is broken down, it detaches from the fiber and base and is easily removed when manually or mechanically extracted. The enzymatic solution will continue to be active until all the organic matter has been neutralized. This will minimize the chance for fiber wick-back, the cause of reappearing stains. On Upholstered Furniture: The enzymatic solution works it’s way through the fabric and into the foam padding, where odor causing organic matter collects. Organic based soil releases from the fabric surface for fast and effective removal. Recommended Use Directions For carpet and upholstery stain removal: Liberally apply Who Done It Pet Stain & Odor Remover to the stain and allow to sit for 3 to 5 minutes. This allows the solution to seek out and devour the organic source of the stain. Using a clean and slightly damp cloth, apply pressure to the stain for a minute or two and remove the cloth. Flip the cloth and gently blot the area until the stain disappears. (Never rub the stain, as this will push the source of the stain further into the surface). Repeat process if necessary. Remember that shipping is free on orders over $149.00. 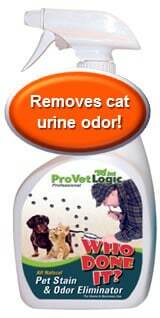 Large scale odor removal can be best managed with ProVetLogic’s Kennel Care.